Parkview Green uses Arc to track data and maintain LEED Platinum status. Parkview Green in Beijing became mainland China’s first mixed-use LEED Platinum building in 2009. Platinum is the highest level of LEED certification possible, yet the team behind Parkview Green was soon considering what should come next. It's now the first project in China engaging with the Performance Score through Arc, a new performance platform launched by GBCI in 2016. Arc uses real-time data to measure sustainability performance in order to facilitate meaningful change and create greener, healthier spaces. Arc’s data-centric approach connects actions and benchmarks performance against itself and projects around it. The Parkview Green team has been using the platform to monitor the project's performance. 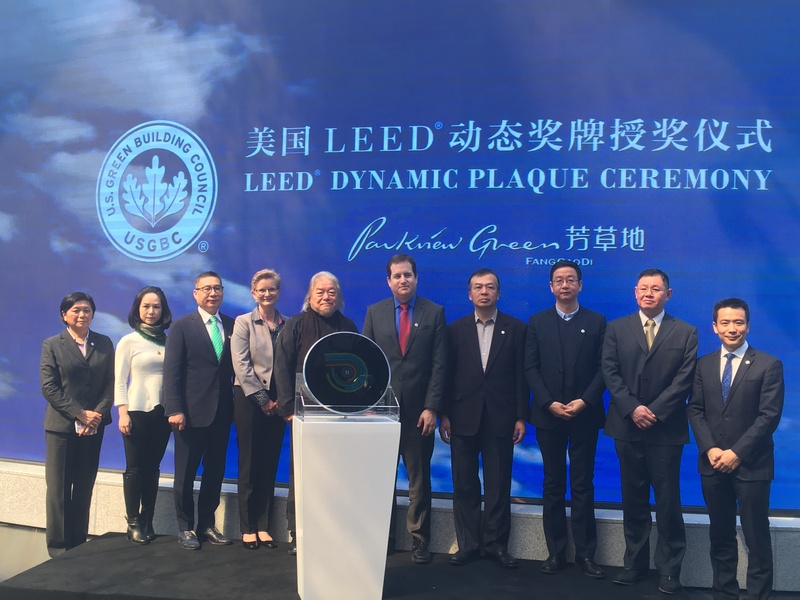 They were among the first adopters of the recently launched platform and have been keeping their LEED Platinum status up to date through Arc's rigorous operational efficiencies. Over the years, Parkview Green has deployed a bevy of innovative design ideas to maintain their LEED Platinum status, such as a stable internal micro-circulation system combined with chilled water systems and intelligent building management. The Arc platform has been helping the Parkview Green team visualize the ongoing sustainability impacts as a performance score. The score is reflected on a scale of 1–100, and higher scores indicate better performance. This simplicity drives effective communications between engineers, consultants, managers and occupants of the building. Tracking a score of 80+ on an ongoing basis, Parkview Green continues to maintain the high standards set for themselves and demonstrate the value of data, technology and management to projects around the world. In development for over a decade, Parkview Green has a long history of meeting sustainability goals. The building, situated between Beijing’s embassy and central business district, had a key challenge to overcome in its design: Beijing law stipulates that every neighboring building window have at least one hour of direct, natural light each day. Parkview Green was faced with “Goldilocks Syndrome": The building could be neither too tall, nor too short—it had to be just right, while still reducing energy consumption. The solution was a pyramid structure. The theory was that if you allowed the building to control the air coming in from the lower level, it would eventually release from the top. The pyramid would serve as a “solar chimney,” pulling air out of the building while driving natural ventilation and minimizing annual heating and cooling demands. Such examples of regional and local solutions are a solution to global challenges of climate change.